this would coincide with our original finding which was there was a large pressure drop across the filter due to insufficient number of holes in the center support and a bypass spring that was set on the high side. Incidentally many filters have quite a low bypass setting which causes the filter to run in bypass mode most if the time. Most filters will do that during startup, but some do it pretty much all of the time since the bypass is set so low. The Fram we looked at was only around 2 psi (this was for the basic cheap Fram, not the new premium filter that they offer now)! Of course the best is a filter that has lower resistance (generally one with more filter area) so that high filter flow is maintained without a large pressure drop. This is the one I use ~ It is a little longer, but does not sit lower than the oil pan ~ I spray it flat black, as the filters on Smart can be seen from the rear ~ I change oil & filter every 5,000. 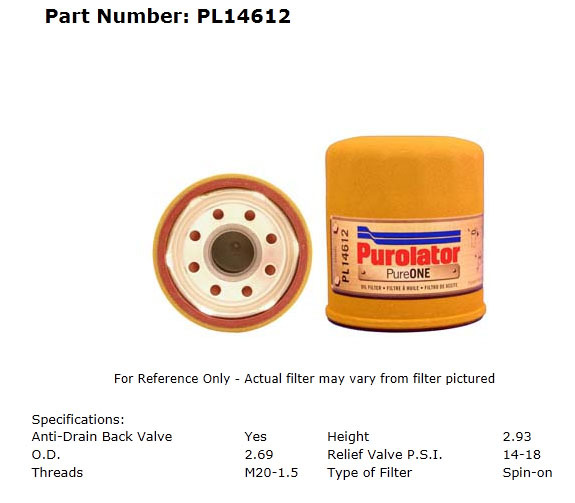 I am starting to like Purolator's too. My Dad's Chevy Cruze air filter was a pita to find, (Advanced Auto) had it for half of the Fram at Maul-Mart. I use mobil 1 m-108 since 0 miles. Change mobil 1 0-40 synthetic every 5000 miles myself up to current 63800 miles. 0.0 problems with anything....just not having enough time to drive the convertible as I would like. In reality we aren't exactly dealing with a high revving exotic here. Since most everyone is running full synthetic I am guessing most any filter out today won't be the cause of problems. Neglect and abuse will be the major cause of any engine problem. What ever a person usually uses he thinks is the best. Just my 2 cents.